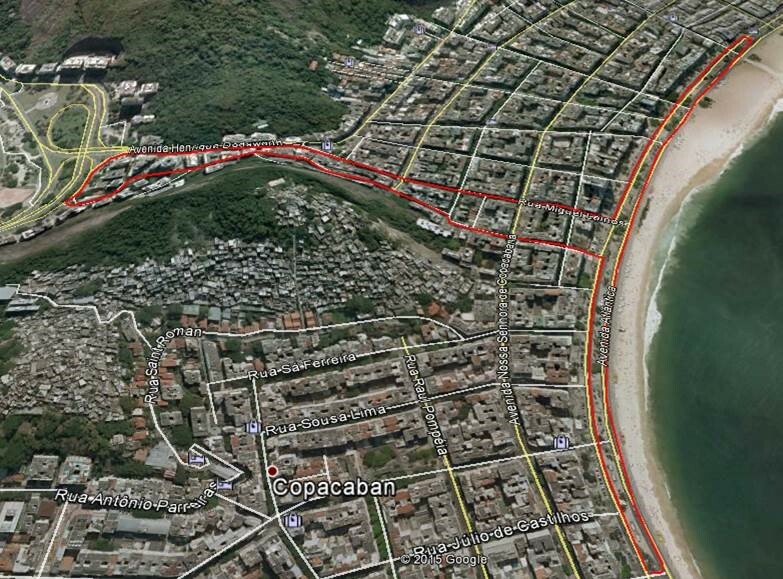 The swim will be by the bottom of the photo and transiton área will be located approximately in front of “Rua Julio de Castilhlos”, on the sea side of Avenida Atlantica. Athletes will go down to the U turn and up (according to the photo position) till the Street called “Rua Djalma Ullrich” In this point there is a 90 degrees turn to the left. This street has a small chicane, and ends when it crosses “Rua Barata Riberiro” Up to this point the course is flat. Course continues straight ahead and the Street is now called “Rua proffesor Gastao Baiana”. The first part of this Street is the steepest climb of the circuit, followed by a fast down hill till “Av. Epilafio Pessoa” besides the Lagoona. 90 º turn and a second one only 200 meters after to “Avenida Henrique Dodsworth” which is a light up and down to” Rua Miquel Lemos” This Street finishes in “Av Atlantico” where athletes do a 90 left turn, then along the Avenue till the U turn and back to the transition Area by the sea side of the Av Atlantico. With these indications and the image I am sure you can easyly find the way in Google Earth. A .kmz file called “Rio bike” is enclosed.